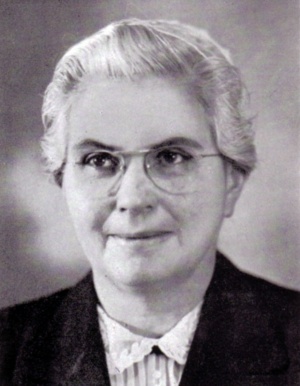 Mary Elizabeth Kolb Derstine: teacher, pastor’s wife; b. 11 August 1901 on her grandparents’ farm near Breslau, Ontario, Canada to parents Elias Kolb (3 March 1865-8 July 1848) and Lucinda (Betzner) Kolb (5 September 1865-18 September 1937). Mary was an only child. On 5 July 1927 she married bishop and evangelist Clayton F. Derstine of Kitchener and became an instant mother to his three daughters. The couple had four children together. Mary died 11 March 1971 in Kitchener. Although born in Ontario, Mary grew up on the Saskatchewan prairie, where her parents went to homestead in 1904. There she learned to handle horses and guns. By the time that drought forced her family to return to Ontario, Mary was a schoolteacher in her early 20s—an attractive, lively young woman. This was a time of controversy at First Mennonite Church in Kitchener. The issue was whether to make it compulsory for women to wear the bonnet. Due to this controversy, a group of people left to form the Stirling Avenue Mennonite Church. In the midst of this turmoil, Mary made a commitment to Christ and chose to worship at First Mennonite Church, where a woman’s commitment was defined by a strict dress code. She was baptized there in 1925 by her pastor, C. F. Derstine, whose wife died a few months later. C. F. and Mary were married in July 1927. A gracious and dignified pastor’s wife, Mary allowed no gossip, either at home or at church. She was a role model to other women in her cheerful acceptance of plain clothing. She participated in the women’s groups at First Mennonite, directed a women’s singing group and led a huge children’s choir during summer Bible School. However, Mary made her greatest impact on the women and girls of her congregation as a Sunday School teacher. She wrote an article for the Mennonite paper, Christian Monitor, on the qualities of a good teacher and taught a Bible study to the end of her life. Over the years, she served as a spiritual mentor to many women at First Mennonite. Roth, Lorraine. Willing Service: Stories of Ontario Mennonite Women. Waterloo, ON: Mennonite Historical Society of Ontario, 1992: 131-133. Regehr, Esther. "Derstine, Mary Elizabeth Kolb (1901-1971)." Global Anabaptist Mennonite Encyclopedia Online. April 2009. Web. 25 Apr 2019. http://gameo.org/index.php?title=Derstine,_Mary_Elizabeth_Kolb_(1901-1971)&oldid=105424. Regehr, Esther. (April 2009). Derstine, Mary Elizabeth Kolb (1901-1971). Global Anabaptist Mennonite Encyclopedia Online. Retrieved 25 April 2019, from http://gameo.org/index.php?title=Derstine,_Mary_Elizabeth_Kolb_(1901-1971)&oldid=105424.